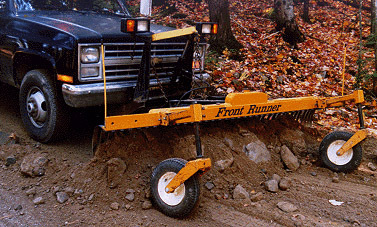 The Front Runner grader/rake is an attachment that fits onto the front of pickup trucks in place of the snowplow or onto the front of skid-steer loaders or compact tractors in place of the bucket. It is used for road grading and maintenance, site cleanup, landscaping, finish grading and snow removal on soft roads. Front Runner consists of a row of heavy duty, flexible, spring steel tines individually bolted to a rugged, welded steel frame. A set of adjustable gauge wheels is attached to this frame ahead of the tines for support. The entire attachment mounts ahead of the operating vehicle, forming the configuration of a miniature road grader. It is controlled either by the truck’s snowplow hydraulic hoist or the loader’s bucket controls. In either case, Front Runner has the advantage of improved visibility and control over rear mounted attachments. The spring steel tines allow faster operating speeds than a bucket or blade because of their “forgiveness” plus they have the ability to separate and remove debris ahead of the vehicle so that it will not have to drive over the debris as happens with a rear mounted or towed device. The most powerful feature that all users have discovered, aside from its time saving capability, ease of operation and its ability to provide outstanding results, is its versatility. A Front Runner can switch from reshaping a road to installing a lawn to clearing mill yard or logging debris to finish grading with no modification or setup. gets you onto your roads earlier in the spring when they are too soft to support a grader or other equipment but are readily workable with a 4×4 truck. Not only does this help shape the surface sooner, but it also helps dry it out. lets you work in warmth and comfort while earning a tidy profit with the 4×4 vehicle that you already own! Please look over the Articles and you’ll see why Front Runner has become the tool of choice for hundred of users throughout New England. We’ll be happy to put you in touch with any of these folks so you can hear their success stories firsthand. Note that as of January, 1996, the skid steer and tractor mounted Front Runner which you see in the photos and sketches on this website is manufactured and distributed under license from Front Runner Corporation by FFC of Lee, Illinois. It is virtually the same unit as the original Front Runner in its design and operation. It is now known as the FFC grader / rake. The FFC grader rake is an approved or recommended attachment for most makes of skid steer loaders. It is designed to mount on the skid steer’s quick change system in place of the bucket. It can also fit almost any other type of tractor with a quick change system and can be easily adapted to those with a traditional pin-on bucket. It is designed to operate forward, in the same natural and comfortable manner as a bulldozer or road grader. The operator can watch where he’s going and what he’s doing at the same time without having to look over his shoulder as he would with rear mounted attachments or front mounted attachments that are designed to operate in reverse! The unobstructed visibility of the skid steer makes it the easiest type of vehicle to use in very confined areas although a conventional frame tractor still provides excellent visibility and somewhat better operating speed and stability. The grader / rake is easy to operate because it uses standard boom and bucket controls in a normal manner. The unit is so simple to control that it can be used with a laser level for precision grading with very little training. The loader’s familiar hydraulic controls prove easier to operate than the electric-over-hydraulic controls of other grading attachments. Flexible tines for debris separation and shock protection, a full floating design for following compound grades and crowning roads, power angling from the operator’s seat and easily adjustable wheels all make the FFC grader / rake operator friendly, versatile and extremely productive. Most operators report a 50% time savings when using a grader / rake for grading, maintenance and site cleanup operations.